(KJIPUKTUK) HALIFAX - As of this morning workers of Town Daycare in Glace Bay, Cape Breton, are on strike. 15 members of Unifor Local 4600 are walking the picket line after negotiations and a conciliation process reached a dead end. “This strike is our last resort. Throughout the negotiations Town Daycare didn't budge on any of our demands, be it around (contract) language or monetary compensation,” Susan Gill, president of the union local, tells the Halifax Media Co-op. Town Daycare counters that there simply is no money. "We don't have the money to raise their salaries - we'd love to because they're worth it - but we just can't because most of our funds come from the government and over the last 10-13 years, all we've gotten is a three per cent increase in those funds and their salaries have gone up a lot," Sally MacLeod, chair of the board, told the Cape Breton Post late last week. Gill agrees that the provincial Department of Education and Early Childhood Development needs to come through. “Of course there has to be an increase in provincial funding,” she says. “For what we ask these workers to do on a daily basis, to look after our children, to nurture them, how can we justify paying them so little?” she wonders. But that said, she believes Town Daycare shares some of the responsibility for a $100,000 deficit built up over the last several years. “There are 97 kids in the daycare. It is full. And there is a waiting list. That deficit just raises a lot of questions,” Gill says. 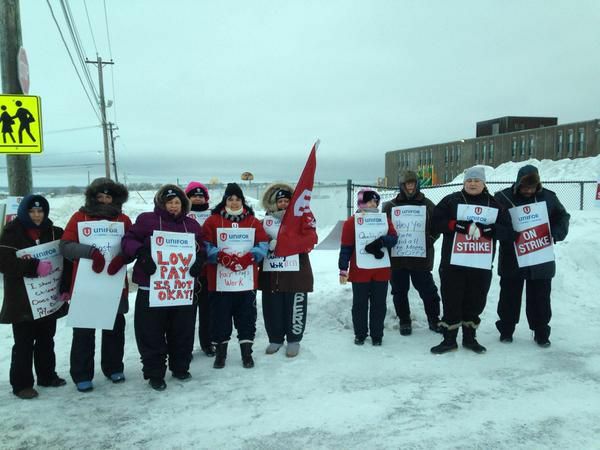 The workers encountered quite a bit of support when they contacted families prior to the strike.